Plans approved to extend a boutique hotel at the heart of Donald Trump’s Aberdeenshire golf course. Aberdeenshire Council and the Trump Organisation have reached an agreement over plans to expand MacLeod House – the centrepiece of Donal Trump’s golf resort at Menie, near Balmedie. Amendments have been made to the Donald Trump golf resort application to reduce the amount of stabilisation required to secure the sand dunes at Balmedie. Conservation bodies have opposed the two golf courses, 950 holiday homes, 36 golf villas and 500 private homes being built on the site of special scientific interest (SSSI). The revised application for the Menie estate resort has been submitted to the Public Inquiry reporters but RSPB Scotland described it as a “small-scale tweak”. Donald Trump’s £1bn luxury golf resort proposal knocked into the long grass by Aberdeenshire Council Infrastructure Services Committee. Donald Trump said he was “surprised” by the decision, and is considering appealing, but noted he had other options in Britain. The vote was tied 7 – 7 but the committee chairman’s casting vote sealed the resort’s fate. 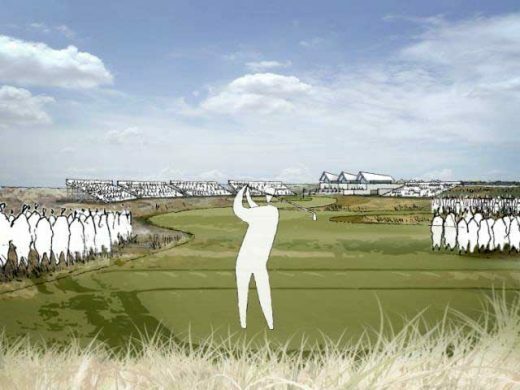 Donald Trump’s £1bn golf resort plans approved by Aberdeenshire Council. Local councillors approved the outline planning application – by 7 votes to 4 – for a golf course and resort development at Menie House, Balmedie, Aberdeenshire. Head of Design Review at ADS, Angela Williams, said: “Should a world-class golf facility be located in such a sensitive landscape, it needs to be realised through an exemplary design process to secure a built development and reformed landscape of exceptionally-high quality. We do not see such an aspiration in the designs as currently submitted. “They would not only have a negative impact on an area of high landscape value but would also devalue the Scottish architectural tradition that they attempt to emulate. We consider that an outline planning application should not be approved on the basis of the information submitted. A tale of American Big Business, Pastiche Victorian Hotel & National Nature Reserve. Golf resort fever hits north east Scotland with numerous recent proposals from Blairs to Newburgh. But Trump International’s plans aren’t for some unwanted fields or set-aside land. Some of the holes are located in dunes valuable to our country. The Menie dunes are a SSSI – Site of Special Scientific Interest – for good reason. Four miles north is The Sands of Forvie and the Ythan Estuary SSSI, National Nature Reserve, home to Britain’s 5th largest sand dune system [considered the most undisturbed in Britain & of unique structure and outstanding national importance], the largest breeding colony of eider duck. And the hotel design? Rather than a confident contemporary we have what appears to be Mock Victorian, no doubt designed to appeal to traditional american golfers. I loved visiting these dunes as a child and would have expected any proposal to tame them would have brought forward serious debate and a sensitive & sustainable building. A competition would have clearly been too uncontrolled for US big business but why not a engage some brilliant designers to come up with a quality development of real architectural merit? What’s important to us here in Scotland? Of course some will warmly welcome inward investment, a good thing often, but at what cost here? The unemployment in both Aberdeen city and shire is less than 2%, so the need for the jobs is less pressing than the need to preserve the area’s best environmental features. Golfers Jack Nicklaus and Paul Lawrie haven`t needed to take land designated for wildlife in their Scottish golf course proposals. The developers hope to start on site with the Trump International Golf Links in early 2008.